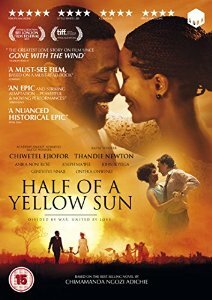 I am glad I finally watched Half of a Yellow Sun the movie. Let's keep in mind that movies are different form of art that cannot totally capture the real essence of a novel. With that said, the film was good although I did not enjoy it as much as I did the novel. To start with, Thandie Newton was amazing in her role as Olanna, she was quite impressive. Nevertheless, if I should give an Oscar to an actor in the movie, it would be to John Boyega, his performance as Ugwu was splendid. In my opinion, though it's been a while since I read the novel, I think he gave more substance to "Ugwu" than in the book. Secondly, I did not like Anika Noni Rose as Kainene, she was not convincing. Neither was Genevieve Nnaji the one who played Lara Adebayo. In my opinion Genevieve Nnaji should have played Kainene and they should have found someone else to do Lara Adebayo. person, though I have lived more years out of my country, I could tell outright that Thandie Newton and Anika Noni Rose weren't t Igbo from the way they spoke the language. Perhaps, they thought it is a minor case since it is a problem only an Igbo person would detect, anyway. However, in my opinion, they should have practised more. To end on a positive note, I like the combination of fiction and history. For instance, there were real images of Ojukwu leader of the Republic of Biafra and real images of Nigeria at that time. Finally, I would not have seen the movie if it was not for the novel so my advice to you is do not swap the movie for the book. You will be highly disappointed. Watch the movie if you are simply curious like me because the film doesn't live up to the book. I am glad you enjoyed the movie, Mary. It was just okay for me. It started strongly, but seemed to lose the plot somewhere along the line. I felt it glossed over too many details, and didn't give Ugwu nearly enough screen time; he was my favorite character in the book, and I was sad to see most of his scenes cut from the movie. My girlfriend, who is also Igbo, raised the same concern as you about the accents, even though I didn't take much of an issue with it. And while I loved John Boyega's portrayal of Ugwu, I felt the true highlight of the movie was Chiwetel Ejiofor's take on Professor Odenigbo. All in all, I felt it was a decent effort for a first time director, and it was nice to have some A-list movie stars in it as well. Well, I wouldn't say I enjoyed it, it was OK. I expected more. I did not expect less from Chiwetel Ejiofor. As an A-list movie star and (as you refer to them) someone of African and Igbo heritage I couldn't expect less. He played his role as much as was expected from an actor of his calibre and heritage. I personally discovered Kunle Afolayan from your comment. I have not actually watched any of his movie. However, I look forward to exploring his works. I do not think that the epic fail (as you call it) of the movie got to only do with the actors. It also got to do with the direction, production, setting, special effects, post.production and above all, budget. Chiwetel Ejiofor was fantastic, Thandie Newtom was impressive (she did really well), John Boyega was splendid. Genevive Nnaji would have shined if she was given a major role. Chimamanda Ngozi Adichie I do not think she has a say in the making of the film, not even in the castings. She simply sold the rights. Correct me if I'm wrong. I'm yet to watch the film, Mary. I've been looking forward to it as a matter of fact. And I will watch it now to see things for myself after reading your words. I look forward to reading your opinion. Yikes! I really enjoyed the movie. But I also have an aversion to books that are over 350 pages and I think this book may be well over 400. I completely understand about the accents. Being from the American South, the accents are distinct. Whenever characters try to replicate it it's almost insulting and, at a minimum, obviously not authentic. Shannon, you should read the book, there is a huge difference. It is a page turner you won't notice the burden of the 400+ pages believe me. Thanks once more. I just checked out your blog. Interesting!!! I have watched the movie recently. I also bought the book, because I have my reservation on the film. I will act when I read the book. haha..... I'd like to know your opinion.